OK - I've found some pictures of the sculpture here as it was being unveiled. 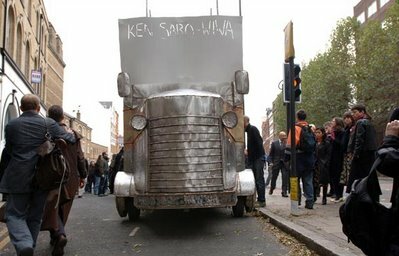 One has to ask why Ken Saro Wiwa is such a big deal in the UK, whereas he doesn't even register on the scale in Nigeria (there's been nothing I've seen in the Nigerian papers or on television about the anniversary of his murder). It is, I believe, quite a complex event to unpack. There is first of all, anti-corporate activism involved - KSW stands as a hero-figure for struggles (journalistic or otherwise) against big-business exploitation the world over. Secondly, is the need to find African resistance heroes, and the desire in the Western symbolic undertow to construct a strong African masculinity figure. KSW stands next to Fela Kuti in this respect. There isn't space and time to go into how this symbolic mechanism works, but it tends to say more about the Western imaginary than it does about realities. The West obscures Africa, and continues to react to the terms of its own obfuscation as a form of symbolic guilt. Hence Live-Aid, Geldof and all the rest of it. An interesting post-colonial type PhD thesis could be written on Ken Saro-Wiwa as symbolic figure, and how his reputation is constructed differently in different places. I am still suspicious of the common Nigerian dismissal - that he was in cahoots with Abacha, that he had others killed, that he was no angel. Whether there is noise and dirt in amidst all the heroism, sometimes we would do well to continue to focus on the heroism. Even heroes have their human, all too human side. This was a man that stood up and wrote and fought and died for his people. How many in this land would go that far? And under what terms could Ken Saro Wiwa be a celebrated resistance figure in Nigeria? What aspects of the configuration would have to change? nigerians like to forget - that's why KSW isn't a 'big deal'here lik eyou put it. which govt is going to point the finger with all the blood they have on their hands? is it obasanjo? The Wiwa affair had just gotten underway around the time I left Nigeria and beyond the cursory, I have no information on KSW. I tend to agree with your idea, Jeremy (gasp! ), about the West's covertly reactionary displays towards Africa, but I say, all the better. If something good happens, what matters its source, good or bad? I'm not sure there are any Nigerian heroes--perhaps in the future--but I don't think I can conciously point to one, except for the symbolic "Nigerian People." To have gone through everything they have is heroic, in the sense of a bull in a Madrid bullfight: we know it's going to die with its face in the dust, bleeding and in agony, but it'll die with dignity. In the hearts of the ordinary people of Nigerians and Ogoni,KSW still lives! Nigeria really has a history of not honouring its heroes and that is why today's kids dont know much about our founding fathers and how they fought to give us independence. KSW was a multi faceted character though - you will have to read a lot of his books to really get an insight into the man. You could also read "In the shadow of a Saint" by his son Ken Wiwa. That is a fantastic read & you should be able to understand KSW better. during my msc class in environmental management at middlesex university, there use to be a great fuss about ken saro-wiwa whenenver the subjucts of environmental activism is raised. Several arguments were raised about the events that leads to his murder. While there are over-the-top western reactionary views about KSW, I cannot deny the fact that I partly enjoyed the attention the guy is recieving as a Nigerian in the international media. Paradoxically, it reminds me of the dark days of the goggled-one.